The persistent flattening of the U.S. yield curve has investors scratching their heads–and searching for historical parallels. The recession of 1969-70 is one worth considering. A closer look at the late 1960s reveals some parallels with today’s U.S. economic backdrop, as we write in our Fixed income strategy piece Summer of ‘69. Inflation was on the rise (albeit much more sharply than today) after a prolonged period of languishing well below 2%. The unemployment rate had steadily fallen to long-term lows below the 4% mark. The economy was receiving a hefty boost from fiscal stimulus (from President Lyndon Johnson’s Great Society programs and Vietnam War spending)–at a time when the cycle was already looking long in the tooth. This parallels the tax cut and spending stimulus currently hitting the U.S. economy, which we see adding as much as one percentage point to growth this year. 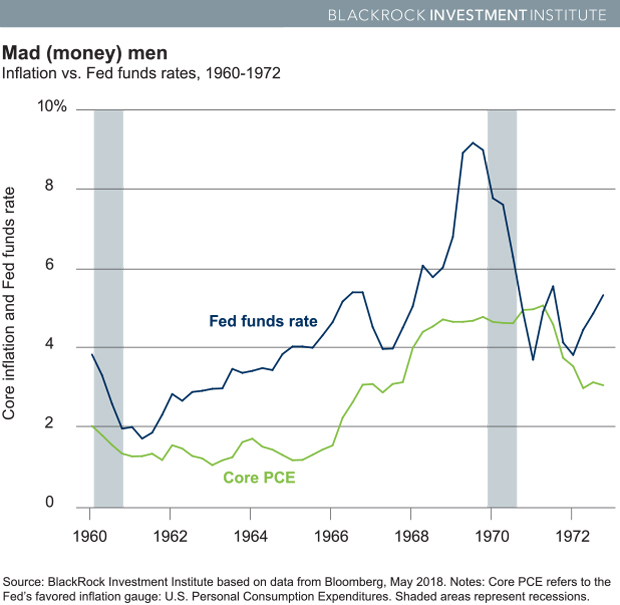 In the mid-1960s, the Federal Reserve shifted from inflation-creating to inflation-fighting mode quickly, as shown in the Mad (money) men chart below. This contributed to a market downturn fueled by overheating–our lead fixed income theme for this year. Back then, late-cycle fiscal stimulus contributed to runaway inflation. The Fed aggressively raised rates, inverted the yield curve–and a recession followed. Is a curve inversion–a frequent leading indicator of recession–ahead this time around? We do not think so. The economic backdrop today is different in key ways from 1969 and 1970. Today’s flatter curve was the intention and result of the Fed’s quantitative easing (QE) program as well as global QE programs pushing all term premia–the compensation for investors moving out the yield curve – lower than in the past. And inflation risks are much less apparent today, as we write in our Weekly commentary Taking stock of U.S. rates. Our BlackRock Inflation GPS points to only a modest rise in U.S. inflation. And it sees inflation stuck well below target in Japan and the eurozone. Technological innovation, globalization and aging populations also all suggest a lower likelihood of inflation rising. We also see no imminent warning signs of recession, as detailed in BlackRock’s Q2 investment outlook. This underpins our overall preference for equities over bonds. But how any recession manifests matters. How does a cycle end? Either it overheats with high inflation, or a financial shock causes a recession through the financial conditions channel. We see the possibility of financial stability concerns manifesting long before inflation risks do in this cycle. Today’s backdrop looks all too much like cycles of the recent past: a prolonged reliance on highly accommodative financial conditions creates vulnerabilities to financial shocks. A financial shock is deflationary–falling markets collapse confidence, leading to lower spending, investment and hiring. In response, the central bank moves toward accommodation mode sending bond prices up. Read more bond market insights in our Fixed income strategy. Today’s lower rates might suggest the Fed has less ammunition than in the past. But former Fed Chair Janet Yellen argued in her 2016 Jackson Hole speech that the Fed still had plenty of tools to fight the next recession. We believe the current Fed leadership likely shares this view. A recession prompted by financial shock could see a large monetary easing with potential for a return to zero or even negative rates–and a possible reboot of QE. The use of these unconventional policy tools would once again lower rates across the curve, increasing the value of bonds. Bonds tend to perform well in such deflationary recessions, but they can fail to offset equity losses amid rising inflation fears. For investors unsure of the path toward an eventual recession, having a foot in both camps may work best as the cycle matures. For a growth shock, some long duration strategies either in core fixed income or municipal bonds can serve as a hedge. For an inflation shock, short duration, floating rate, inflation linked and credit exposures can act as better offsets to equity exposures under an overheating scenario.